So all the Pokémon for this generation are new, but I also get the impression that the games’ aspects of connection and communication have been strengthened. Why did you decide to make them connectable to the computer? I wanted players to be able to enjoy Pokémon Black Version and Pokémon White Version even when they weren’t using their DS. I thought computers were the perfect tool for communication, and that they could be the next stage for the Pokémon games. Ishihara-san, what did you think when you heard about connecting to the computer? Actually, most of what The Pokémon Company does is related to computers, whether it’s for promotional efforts or the Pokémon Daisuki Club.11 I’d been thinking for quite some time about the possibility of tying things like that to the games themselves. But I knew it wouldn’t be easy. 11Pokémon Daisuki Club: A website operated by The Pokémon Company. 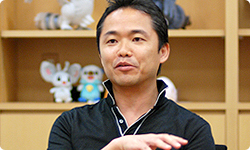 As the Pokémon official fan club, it has over two million members in Japan. 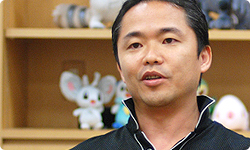 Masuda-san, when you tried to do it, was it harder than you expected? But they told me that was impossible. (laughs) So finally, we decided to connect via Wi-Fi, but then we had more trouble figuring out how to handle the computer world. It took quite a lot of time to eventually settle on what we ended up with, this kind of “dream world” on the Internet. At first, I thought it wouldn’t be right if it wasn’t the player him or herself who appeared in the computer world. Because it would be weird if a Pokémon talked. So I imagined creating an avatar, somewhat like a Mii, and having it live in one world. But then I was like, “Hold on a sec.” Your avatar in the computer is different from the main character in the Nintendo DS, and, of course, it’s also different from the real you, so... it felt disjointed. In other words, there were three main characters. Exactly. It didn’t feel right. In other words, you decided to have only Pokémon, and not an avatar, show up within the computer world. 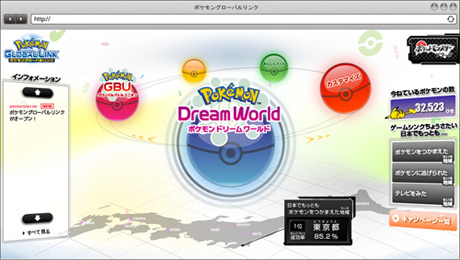 12 Pokémon Dream World: Part of the Pokémon Global Link website, which can be accessed with your computer via the Internet and is linked with Pokémon Black Version and Pokémon White Version. First of all, you need a Wi-Fi environment for your Nintendo DS and a computer. When you play in the Pokémon Dream World, you can bring items and berries that you acquire to your Pokémon Black Version or Pokémon White Version on your Nintendo DS. Also, it allows you to communicate with all kinds of other people. You can connect and communicate with people all over the world, not just within Japan, who are playing Pokémon Black or Pokémon White, right? Right. So, by connecting the games to the computer, we can expect a wide variety of connections to form across the globe and across generations. 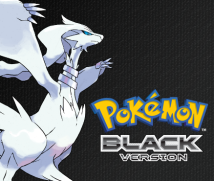 Now you can enjoy the world of Pokémon Black Version and Pokémon White Version even when you’re not using your Nintendo DS, so I feel like the Pokémon series has taken a new step forward. How long did you work on it until you saw results? I think it took about two years. Yeah. (laughs) I spent a lot of time alone thinking about the games. I would think about them as I commuted to work by train, and when I thought of something, I would send the idea to myself with my mobile phone via e-mail, and check it when I got to work. And while you connected the games to the computer, you also adopted infrared communication for connection between Nintendo DS units. At first, we didn’t intend to use infrared. But I wanted the games to be connected all the time, so early on I did a lot of experiments related to that. I was using wireless to send and receive a bunch of data, when I realised the battery was only lasting about half as long as it should. If you use the wireless at full power for long periods of time, it runs out of juice in no time. I thought players wouldn’t like that at all! (laughs) So I decided to try a different method. When I was looking for a way to connect to the computer and consulted the staff at Nintendo, someone suggested infrared. The infrared game card that we made for Walk with me! Do you know your walking routine? .13 13Walk with me! Do you know your walking routine? : Software that helps users record the number of steps they take per minute. The two Activity Meters that come as a set with the game use infrared to communicate with the game. First released in Japan in November 2008. Walk with me! Do you know your walking routine? was developed by Creatures Inc., so the connection between the Pokémon series and infrared communication is deep. 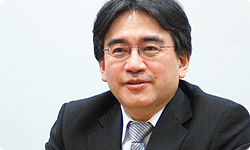 For more information, check out Iwata Asks: Pokémon HeartGold Version & Pokémon SoulSilver Version. Yes. We learned that when you battle or trade with someone right there with you, if you face each other and connect via infrared, and then afterward switch over to wireless, it decreases the drain on your battery. I found it interesting myself. Using infrared to communicate between game systems is like we’ve returned to the days of Game Boy Color, but first connecting via infrared when you’re together facing each other and then switching to wireless makes it possible to continue to communicate even when you’re further apart. even while the main character is walking around the game world, you can trade with your friends by turning on the infrared, and trading Pokémon from inside a PC Box in a Pokémon Center . That is unbelievably convenient! (laughs) Isn’t that the first time Pokémon from inside the PC Boxes have come out so seamlessly and easily? Why did you decide to make such a big move away from the old system of going into a Union Room and trading only what you had on hand? We thought trading should be easy for the Pokémon games. You wanted players to be able to trade more easily. That’s right. Besides, like I mentioned at the beginning, I wanted temporarily to break down every aspect of my fixed conceptions about what a Pokémon game should be like, so I was always testing things and asking, “If I did this, what would happen?” This time you can use a wireless and infrared feature called C-Gear. Gear that has appeared in the series so far was always something the main character within the game had on hand. But this time it’s different. It belongs to the player him or herself, so you can trade Pokémon from inside your boxes and trade even while trekking around during the adventure. It belongs to the person actually playing the game, so you can trade whenever you want, as much as you want. C-Gear has a variety of functions. One is called the Xtransceiver.14 14Xtransceiver: A feature that uses the Nintendo DSi and Nintendo DSi XL camera and microphone to allow players to video chat with friends with whom they have exchanged Friend Codes. (Only voice chat is possible with the Nintendo DS Lite.) While chatting, you can draw graffiti and change the pitch of your voice. Video chat is possible for up to four people via wireless connectivity and two people via Wi-Fi Connection. Xtransceiver came from an idea we had for talking with the professors in the game. I thought it would be neat if we could use that in reality, too, so I began trying a bunch of things out. To look at someone’s face and talk to them you need a camera, so you can only do it on the Nintendo DSi or Nintendo DSi XL, but some people wondered whether it would be any fun for people in the same place, like the four of us here today, to connect wirelessly, put themselves on their Nintendo DS screens, and talk. Because if you’re in the same room, I can look directly at your faces. So I thought that adding graffiti would be fun. You make the colours for the pen with a dropper, but the colours come from the camera. It would have been easy to make it so you chose colours from a palette, but I wanted part of the fun to be figuring out how to make certain colours. For example, if you touch the lens of the camera with your finger, you get surprising colours. It’s fun to discover things like that. Also, we didn’t put borders between the pictures. So, for example, if you take a picture of half your face and half your friend’s face, you can see them together as one face. I think it would be great if people play around with it like that, too. I was so amazed by it that I couldn’t help but guess your ulterior motive. If something like that had been around when I was a kid, I’d have been playing with it all the time. When you and I were kids, Ishihara-san, anytime someone got a transceiver, he was everyone’s hero and we all played with it together, as you may remember. This is like a powered-up version of that. The day has come when children all over the world can easily use a device like a videophone. I thought it was a dream device.